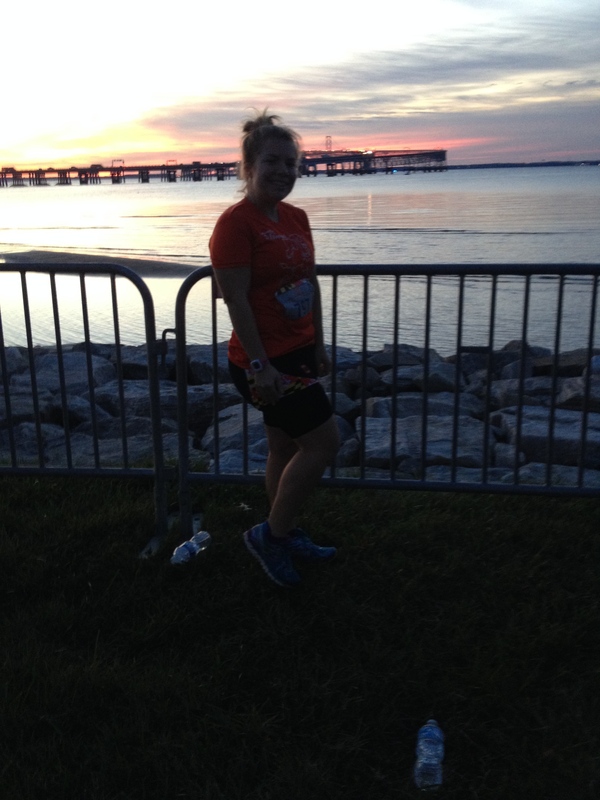 My race times have been relatively slow this year, so even though I have the standing goal of breaking 50 minutes for a 10K, I didn’t feel like I was going to meet that goal going into the Across the Bay 10K. And I didn’t. I didn’t even come close. Running is a very mental sport, and I just wasn’t feeling it today, on Sunday. I started feeling some shin pain — nothing super painful, but enough to be an annoyance — and stopped a few times to roll out my legs. And even when I felt like I was going faster, I really wasn’t going that fast. After seeing my first mile took me more than 9 minutes, I stopped for a brief selfie (which didn’t turn out too well) and a photo of people running on the bridge (I like that one). My watch logged a 57:53. That’s just three seconds slower than my time at my slowest 10K race time, the Great Wyoming Buffalo Stampede earlier this year. My official results showed a time of 57:59. My watch, which also tracked the distance at 6.16 miles instead of 6.2, tracked that at a 9:24 average pace. But my mile times were very inconsistent. The first mile, I ran in 9:06, according to my watch. The next one, in which I stopped for the brief photos and to roll out my leg, was 10:24. My watch logged the following miles at 9:14, 8:54, 9:37 and 9:25, and 1:14 for the last little bit. While I didn’t feel super amazing during the race (and I had just donated blood on Monday, so there’s another excuse I will offer), I still enjoyed the race. 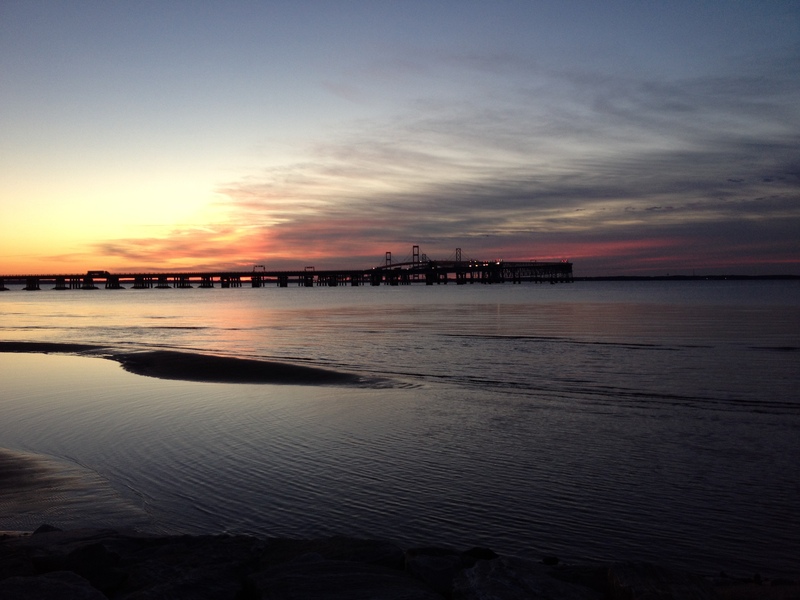 You can’t just run across the Bay Bridge anytime you feel like it. It’s such a cool opportunity to be able to do so. I drove up with my friend Veronica on Saturday, and we stayed in a hotel, getting to the very close parking area to snag spots No. 3 and 4 in the bus line — we were both in Wave 1. There were very clean portable toilets at the start. And we had time for photos and to see the sunrise before the race began. I don’t normally bring my phone during races, but I wanted to be able to get some photos and be able to meet up with people afterward, so I’m glad I did. I was able to see my mom right before she crossed the finish line for her first 10K (she beat me! ), I got to meet up with a high school friend and I also saw a few different running friends after I finished the race. Then, I even ran into one of my friends at the Easton Rise Up Coffee. Veronica and I went there afterward because like some of the other larger races I’ve done, the free food offerings weren’t great. While last year I didn’t have too much of a problem with the gradual incline up the bridge, this year I really felt it. I also felt a relatively small hill near the end, and even walked a little bit at that point — that wasn’t my first time taking a short walk break. I thought the weather was pretty nice — low 50s — and I wore a short-sleeved shirt and shorts for the race. That was perfect for running, but I was cold after. 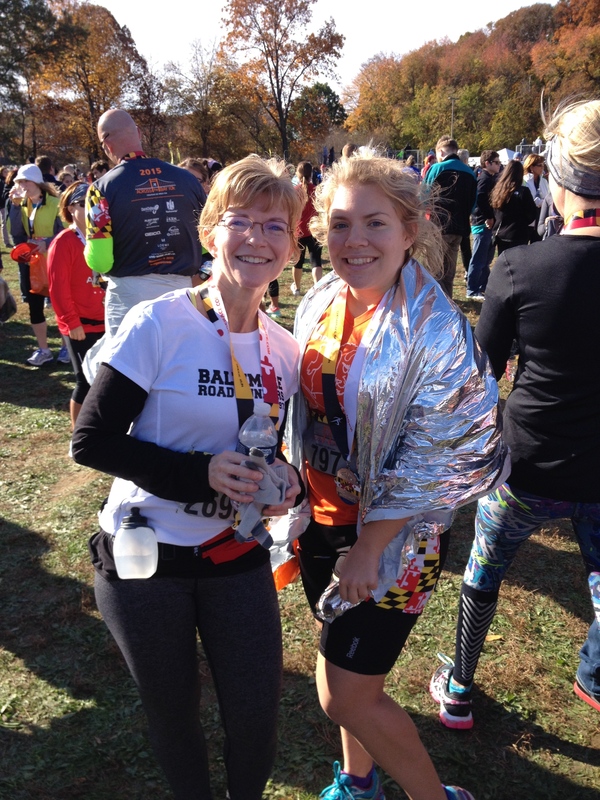 It’s cool that the shirt and medal have a Maryland flag theme: The Maryland flag is on one of the shirt sleeves, and the pattern is on the ribbon for the medal. The medal also attached to last year’s. 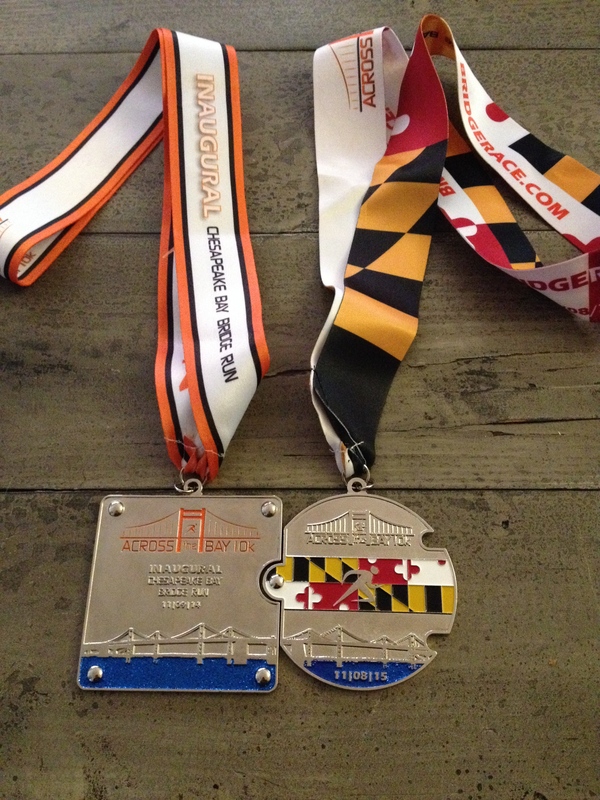 Next year, I’ll be able to attach another medal to the chain, as Veronica and I already signed up for the 2016 race. 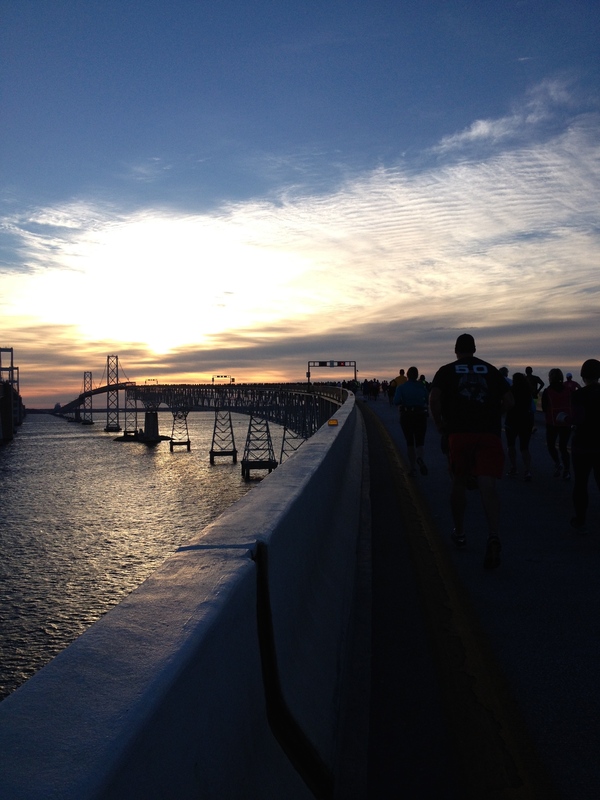 It’s not a race I would want to miss — there are some races where I run parts of a course even when a race isn’t happening, but that just isn’t possible for the Bay Bridge. I’m a producer at WBOC and recognized your name when you posted a link to this in the race Facebook page. Just wanted to say hi and that I really enjoyed reading this, as my boyfriend and I ran the 10K this morning. I’m a pretty new runner but couldn’t pass on the opportunity to run across the bridge. Oh cool! Congrats on finishing the race with your boyfriend!! It was a fun one 🙂 Hope the rest of your running goes well! Your photos look great. Good seeing you today.